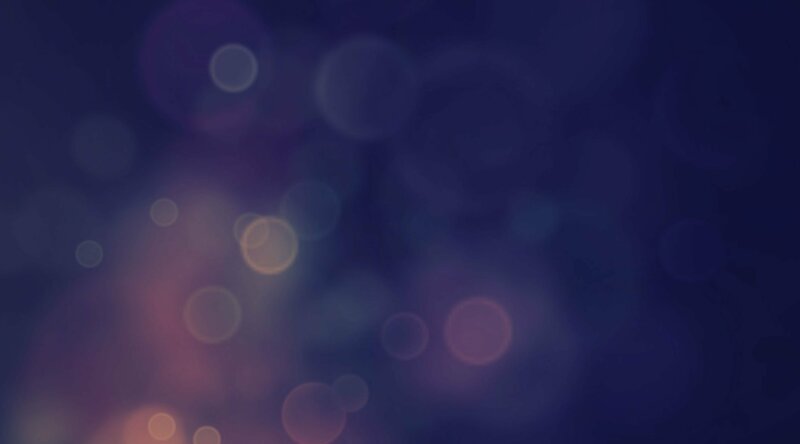 While amazing graphics can be created with traditional programs such as Adobe Photoshop and online replica websites such as Pixlr, it can be challenging to create a graphic from scratch and then load it into Switcher Studio, especially for those new to mobile video creation and graphic design. As a result, many users spend their time searching the App Store for graphics creation tools to help them create their graphics right there on their iPads, iPhones and iPod Touches. Introducing, the free app, Over! 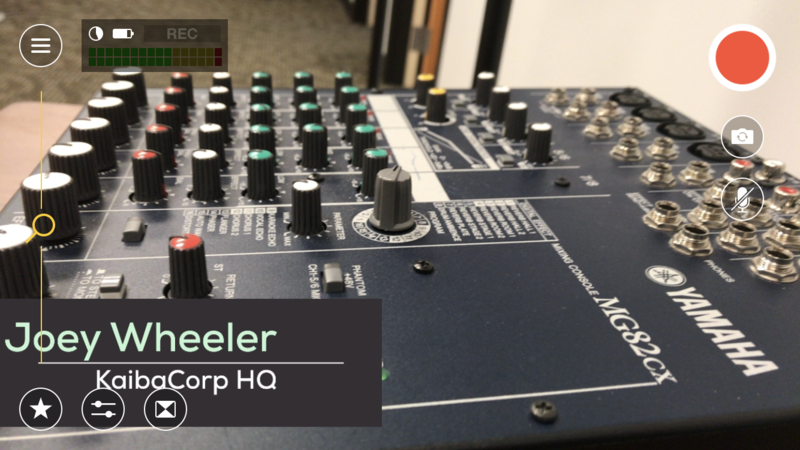 Over is a great way to create lower-thirds graphics quickly and easily for use with your recordings and broadcasts inside of Switcher Studio. Its user-friendly features help you to create graphics at the size you need, add properties without needing advanced design knowledge, and import the final product into your Switcher Studio app without breaking a sweat! Getting started with Over is quick and easy. First, go into the App Store and do a quick search for "Over." It will be a free download for you to install onto your iOS device. Once Over is installed, open the app. You will see a lot of default graphics here. For our purposes, tap on the "+" in the top-right corner, which will take you to the graphics creator. You will be given choices in image size. For a lower-third, select the 3:1 option (2048x683). This will populate the image in a way that corresponds with widescreen broadcasts and recordings, which is how most televisions and computers are configured these days. You are now ready to begin creating your lower-thirds graphic. Tap on the "Text" option at the bottom of the screen. Once you tap on "Text," you can type whatever text you'd like. Using the options at the bottom of the screen, you can also change the color, size and font of the text. Once you are satisfied, tap on the yellow check mark at the top-right corner of the screen. If desired, you can then tap on "Text" again to create a second section of text. It is recommended to do this for interviews, so that the subject's name and company/title are present for the audience to see. Now, let’s add some color behind the text for your lower-third. To do this, we will need to put a Graphic behind your text. Tap on "Graphic" at the bottom of your screen. You will see several basic shapes available. These, however, are all outline-only options, so you will want to scroll down further on the app. Further down, you will see more basic shapes, this time with backgrounds to them, rather than just outlines. Select the square shape. Use the options at the bottom of the screen to resize your shape (do this by enlarging the size) and change the color of the shape. When you are done, you will realize that you can no longer see your previous text. To correct this, we need to rearrange the layers in your image. Each component is a separate layer. Tap on the layer stack icon at the top of the screen. It will be the third icon from the left. You will now be able to see all of the layers in your image. Holding your finger down on the three horizontal lines next to each layer will allow you to drag that layer around on the screen and move it anywhere you'd like. Drag the shape layer so that it is below the text layers. When you are done arranging your layers, tap on the arrow in the top-left corner of your screen. Continue editing your lower-third graphic until it looks the way you desire. For this example, we went back into the "Graphics" tab and inserted a plain white line to break up the subject's name and company. When you are done with your design, tap on the yellow box-with-arrow icon at the top-right corner. This will allow you to export the image to your Camera Roll. If you used a shape to cover your background, simply select "Save Image," and you're all set! However, if you are using a transparent background, scroll to the right of the options, and choose "Save PNG." How Do I Get This Overlay Into Switcher Studio? Now that you've created your new overlay, you can bring it into Switcher Studio for use during your broadcasts and recordings. In the lower-left corner of your interface, you will see a little star icon. Tap on the star, and it will open up your sources menu. Tap on the box with the blue plus-sign to open up your Assets menu. Select "All Photos" and choose your brand-new overlay from your Camera Roll. 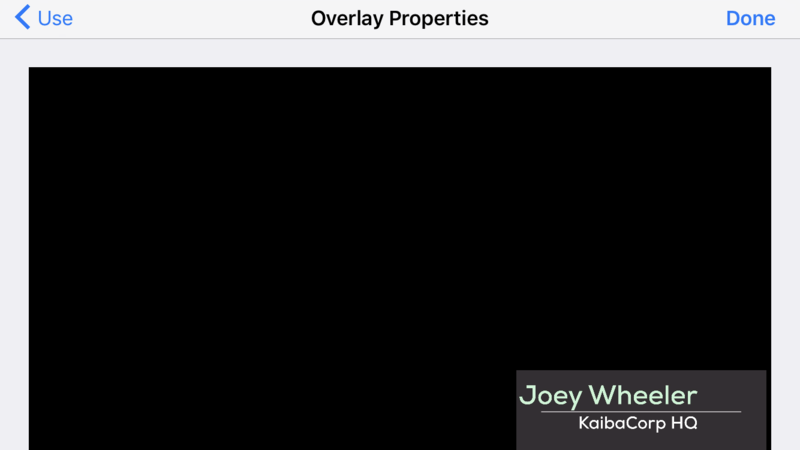 Select "Use as Overlay" so that your transparency is retained. 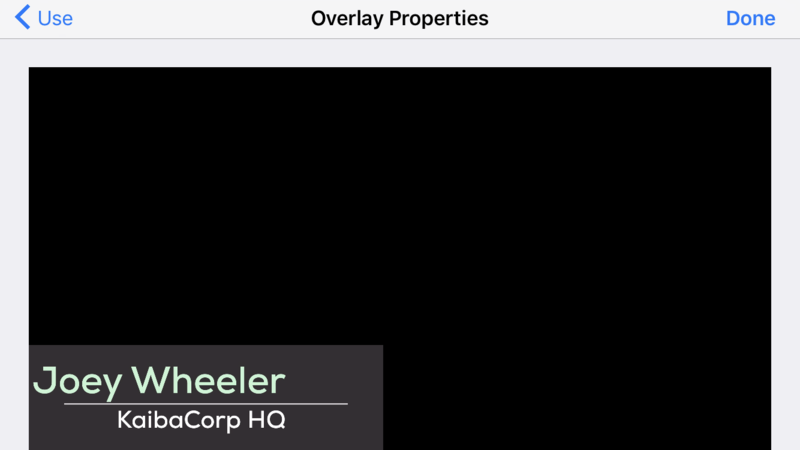 By default, your lower-third overlay will appear small in the lower-right corner of the Overlay Properties screen. You can drag this overlay around the screen to place it anywhere that you would like, and you can also make it bigger or smaller by using the pinch-to-zoom technique on your screen (i.e., Hold two fingers down and drag them apart to expand the image or closer together to shrink the image). As you can see, I enlarged my lower-third and placed it in the lower-left corner instead. Tap "Done" when you are finished tweaking your image. After tapping "Done," you will be taken back to your normal camera view, and you can see your new overlay waiting to be used. 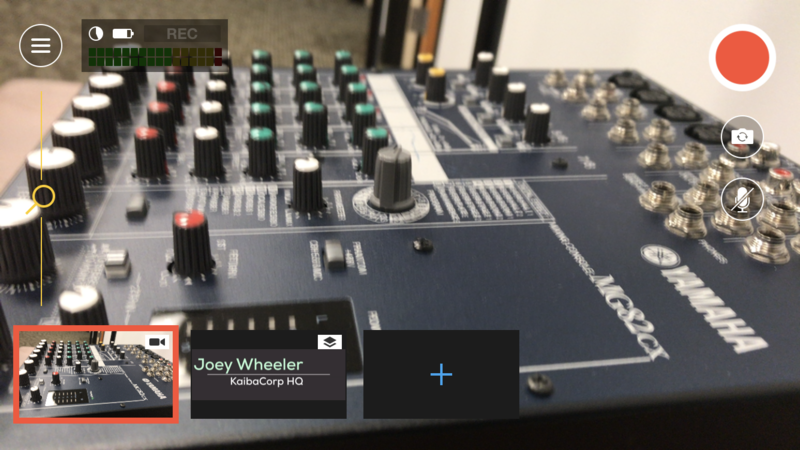 Just tap on the Overlay at any time (even while broadcasting and recording), and it will appear on your screen just the way you intended for it to look. To get it to go away, tap on the source again, and it will disappear.